Want to help encourage healthy community design in Pennsylvania? This quick (10 min) survey lets APA Pennsylvania’s Healthy Communities in PA task force know your healthy community design priorities to help identify resources for Pennsylvania’s communities. 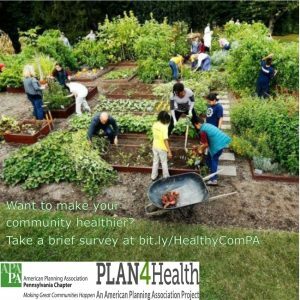 If you are involved with a program or project related to healthy community design, including it in this survey can help you advertise your program as a resource to other Pennsylvania communities. Let them know what you think at bit.ly/HealthyComPA!